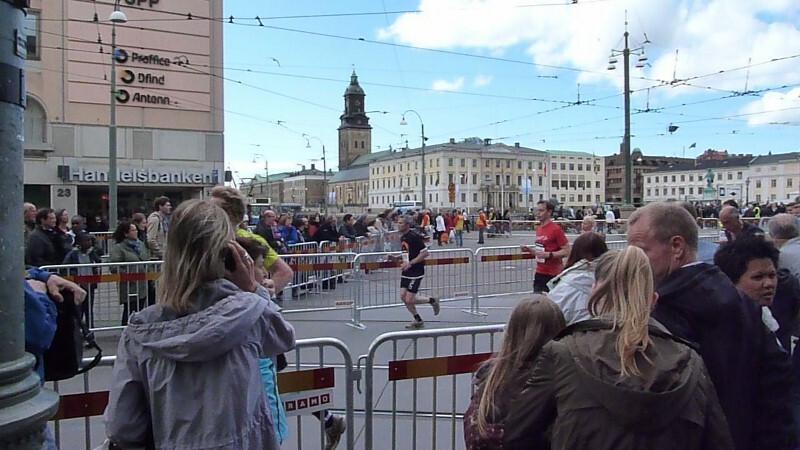 Today I had the accidental experience of attending Göteborgsvarvet, which is apparently “the world’s largest half marathon.” As a (former) half-marathoner, I am surprised I didn’t know this was the home of the world’s largest half! I should have had an inkling something was up when I saw a Swedish acquaintance’s Facebook post saying she was off to “toe the line.” It also suddenly makes the choice of our last book club selection make sense. It was called “Born to Run: A Hidden Tribe, Superathletes, and the Greatest Race the World Has Never Seen.” I thought someone in the group must be a runner, or maybe all of them since I hadn’t actually met them in person yet. Otherwise, it seemed an odd choice for anyone who isn’t really into running. Even as a runner, I wasn’t sure if I wanted to read it but it was meant to be my first meeting with the group so I downloaded the Nook version. Turns out, I didn’t make it to book club, and I still haven’t finished the book. A bit anticlimactic after hearing of the main character’s actual death in the hills of New Mexico on a training run as I was just 10 days into reading it. Always a buzz kill when you know the end of the story. My second clue came when the tram driver made an announcement. The stops are announced by automated voice so when the driver speaks, you know something’s up whether you can understand them or not. Turns out he was announcing that the tram would turn around at Centralstationen instead of continuing as normal. No biggie though, it was only one stop before my intended one so just a bit of a walk. After walking a couple minutes I saw the blocked roads, crowd and… runners! My heart did a skip. As much as I hated running, I also loved it. And I miss it. So, the above was actually the second happy accident of the day. The first was at the local Saturday outdoor market. It’s the typical sort of place where you find clothes, electronics, produce, etc. I was struggling a bit at the butcher though because the young assistant didn’t speak English at all, I didn’t speak his native language (Farsi, I presume), and obviously I’m still working on my Swedish. I’m not even sure how much of that he knew. Anyway, after a few minutes, a lovely woman with Caribbean-accented English began to help me understand the cuts of meat they had, helped me pick one out for my stew, and even made sure I had a proper recipe in mind. She asked where I was from, then told me she was from Jamaica. She was sweet, and fairly representative of people you meet. Particularly those who are from somewhere else themselves. I guess they remember when they were new too. I didn’t want to let her go. I wanted to ask where she lived and what was her phone number, but at the risk of sounding like a crazy American, I let her slip away quietly into the crowd. Want to leave a comment? Click the little talk bubble in the upper right of this post.